This small 3/4 bass was made by Alvisio Piattellini circa 1790. It is currently being offered for sale by Paul Biase. Contact him at 130 W 42nd St., Suite 711, New York, New York, 10036 Phone (212) 840-8373. 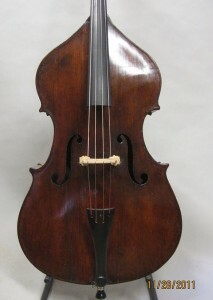 The top of this bass is quartered spruce, the back and sides are Italian poplar. The string length is 39 9/16″ (100.5 cm.) Its clear, singing sound is impressive both for its volume and for its low end. It was once owned by the Curtis Institute in Philadelphia, as the embossed brands at the endpin and on the button attest. Curtis records show that back in the nineteen thirties it had in its inventory an Alvisio Piattellini. 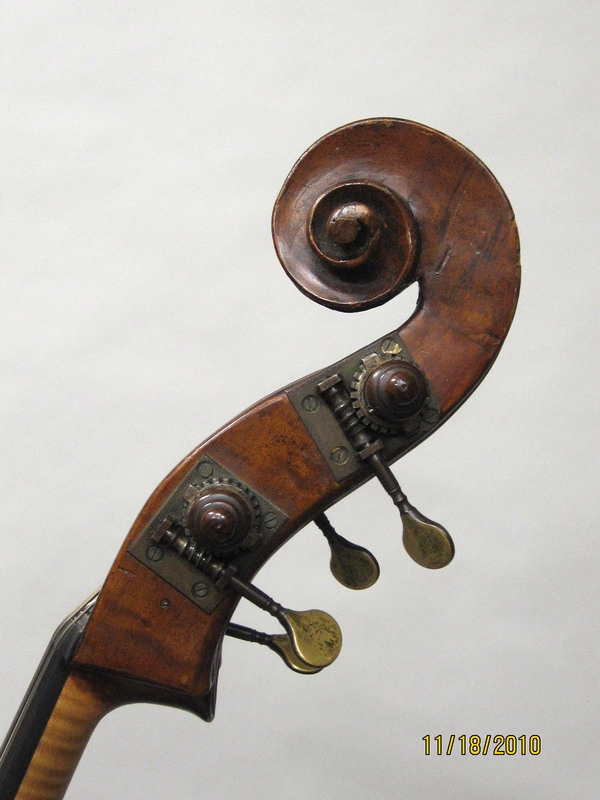 This bass in pictured in the Elgar book “Looking at the Double Bass” on page 110.